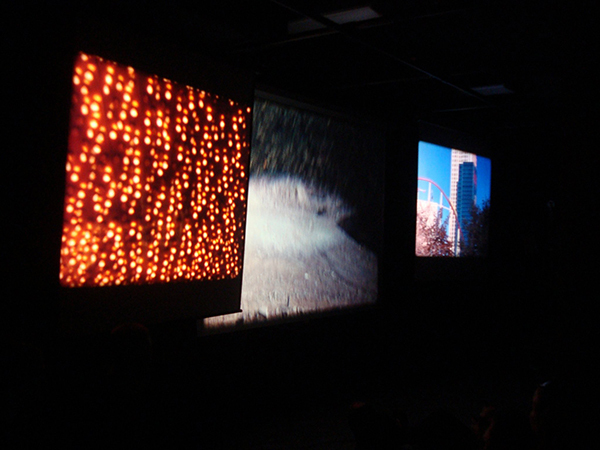 Experimental filmmaker Roger Beebe’s 2015 touring program of multiple-projector performances and single-channel HD video includes the premiere of his latest multi-projector mayhem, Sound Film. These works take on a range of topics, from the forbidden pleasures of men crying and the secret logic of the book of Genesis to Las Vegas suicides and companies jockeying to be at the start of the phone book. “Beebe’s films are both erudite and punk, lo-fi yet high-brow shorts that wrestle with a disfigured, contemporary American landscape” (Wyatt Williams, Creative Loafing). Roger Beebe is an associate professor in the Department of Art at Ohio State University. He has screened his films around the globe at such unlikely venues as the CBS Jumbotron in Times Square and McMurdo Station in Antarctica (and in more likely ones like Sundance and MoMA). Recent solo shows of his work include the Laboratorio Arte Alameda (Mexico City), the Wexner Center for the Arts, and Anthology Film Archives. Beebe is also a film programmer: he ran Flicker, a festival of small-gauge film in Chapel Hill, NC, from 1997-2000 and was the founder and artistic director of FLEX, the Florida Experimental Film Festival from 2004-2014. Image: Money Changes Everything, 2011.